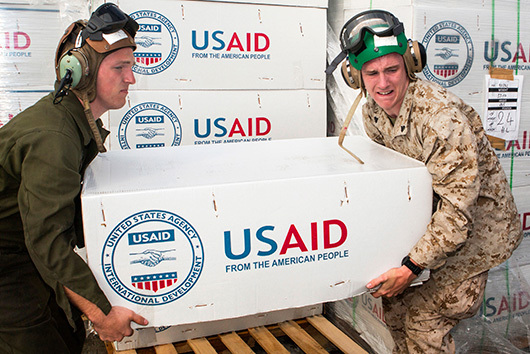 Volunteers providing state-funded aid from the United States. The recent tax reforms enacted under Donald Trump and the Republican Party have raised a host of criticisms. A primary criticism has been that the reform will contribute to greater income inequality, allowing greater funds into the hands of the oligarchs controlling the largest corporations on Wall Street. The Trump tax reforms reduce taxes across the board, however, they predominantly favour corporations and wealthier citizens. The permanent corporate tax, for example, has been cut to 21% from 35%, while middle and lower income individuals will see only marginal declines in their taxes, and they will be temporary. Furthermore, the resulting cuts to a wide variety of social services, including education and Medicaid will disproportionately affect lower income groups. An aspect of the tax reform that is less remarked-upon is the consequence its adverse effect has on international charitable giving. Trump campaigned on reducing the state foreign spending, including reducing state-funded foreign aid. The reform raises potential threats to the most destitute and disadvantaged around the world. Several writers have warned of the problems that might arise from the lowering of taxes, principally that there will be less of an incentive to donate because donations would yield lower tax savings. Such criticisms are generally presented in the context of the “average” taxpayer, and tend to focus on the overall levels of giving that may be affected. The interest here, however, is less with middle-class donors, and more with the “super givers” – those multimillionaires and billionaires who support some of the richest foundations in the United States. There are two outcomes for foreign aid that might flow from these tax cuts. On the one hand, there may be a decrease in charitable giving if the behaviour of “super givers” conforms to that predicted for the “average” middle class taxpayer. It has been shown that taxpayers give more when tax rates are higher because the charitable deductions are worth more to them and they get more value out of their donations. This argument suggests that there will be less money made available by these super givers to support the international activities of the large foundations. The alternative outcome presupposes that such large donors will not follow the pattern of the average donors. Firstly, this is because the very magnitude of their wealth insulates them from the normal budgetary considerations that drive middle class taxpayers. Second, it is contended that, to the degree that they are influenced by the tax reforms, they are likely to be in a position to increase their charitable giving as a consequence of the asymmetrical effects of the reforms, noted above. While the latter possibility might seem positive at first sight, there are significant downsides to this shift in resources to large private foundations. Specifically, under the Trump reforms fewer resources will be made available to the state to provide publically directed international assistance, with a consequently larger role accorded to private foundations. This is particularly concerning given the continuing criticisms of the role and nature of these very same private foundations, notably around issues of accountability and transparency. A good example of this dynamic is provided by the Bill and Melinda Gates Foundation, one of the most influential philanthropic organizations in the world, with a goal of promoting the well-being of others and mitigating poverty around the world. These are certainly admirable goals, but the decisions made around achieving these goals – for example the choice of issues to be addressed and the means of implementation – are certainly contestable. These decisions are made by a small number of trustees of the foundation, trustees with no accountability to the general public and no accountability to the targeted population – and the not targeted population. With almost $43 billion dollars in endowment (2015 figures), the Gates Foundation exerts a considerable influence around the world through its sheer spending power, but does so with virtually no external controls when deciding what are in effect public policy and priorities surrounding aid. Specific criticisms leveled at the Gates and other such immense philanthropic organizations (referred to as “philanthrocapitalism” by critics) include not only a lack of accountability and transparency, but also a neglect of the needs of local health systems. The criticism is that they often concentrate on vaccines and other health technologies and give priority to certain high profile diseases while ignoring more deadly and widespread conditions such as obesity. There is also the criticism that such groups generally do not take into account local perspectives on what are the most serious health threats. These problems can, of course, present themselves when the assistance is provided on a state-to-state basis, but an important difference is that democratic pressures, elections and organizing at home can influence the donor state to change; representative institutions and processes come into play – institutions and processes that do not pertain to wealthy private foundations. The continuing shift in resources to the wealthiest Americans will potentially lead to more resources available to philanthropic foundations and agencies, resulting in an even greater influence of these groups over the nature, direction and substance of foreign assistance. This will result in less accountability and less transparency in the dispersal of such aid and an even greater influence on the part of these groups over international aid initiatives and directions. The danger is that larger and larger sectors of foreign aid will become “privatized” and the democratic input of citizens through their government will become less important in directing international assistance. It is not argued here that large foundations do not do good work, but it is the case that the money made available for such endeavours as a result of the Trump tax reforms comes from these very same citizens through tax resources foregone via lower tax rates and tax write-offs for charitable purposes. This represents is a shift in control over foreign assistance from the state to the private sector. No matter how well intentioned private sector actors may be, this entails a corresponding loss of control on the part of the American public over aid policy and priorities. The latest American tax reforms not only promote the transfer of wealth within the country to those least in need, but also unavoidably affect the role of the United States in improving the fortunes of the world’s poorest people. Most obviously there will be a significant reduction in the actual aid provided by the American government and a consequent retreat from a range of initiatives as funding is reduced. The U.S. is the largest contributor of aid in the world and Trump has proposed cuts of approximately 32% that would leave a multitude of initiatives such as AIDS Relief and development assistance starved for resources. The impact on American private sector aid is less certain. However, even if one assumes that the gap left by the U.S. government will be filled by large, private foundations (which may indeed prosper as a result of the reforms), this will have the effect of accelerating the privatization of foreign assistance. If such transfers of resources and responsibility continue to occur, and the American state continues to step back from foreign assistance, at a minimum there must be regulatory mechanisms in place that ensure greater accountability and transparency on the part of these foundations. Without these, the attendant dangers of a privatized international philanthropy will only grow.